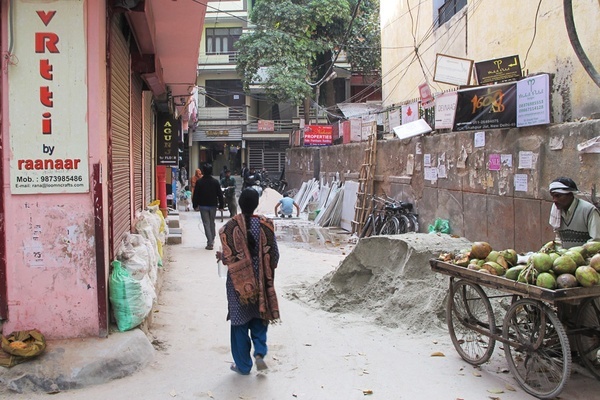 Fashion writer Liza Foreman takes a tour of Delhi's designer neighborhoods and discovers the vibrant contrast between Old and New Delhi. 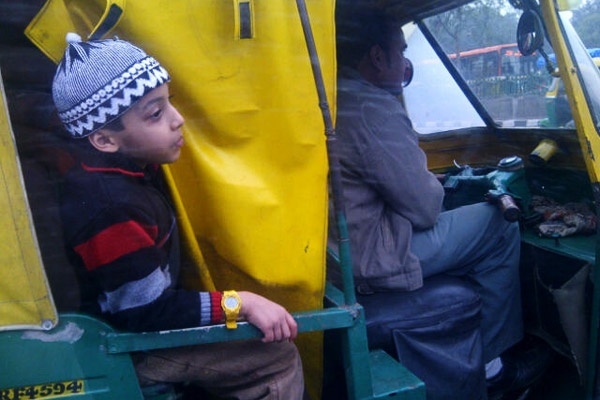 DELHI, India – My trip to Delhi began in the middle of the night at a desolate high-rise soaring through the fog. It was the home of my long-lost cousin, and it appeared, in this dense white night, to be the only building for miles around. The last time I had last seen him, he was a ten-year-old perching atop a ladder painting our neighbor's house with half of his bottom exposed to the world. And now he lived here. It wasn't quite what I had expected. But en route to my flight from Heathrow, I followed his advice and ditched the hotel I had reserved near the train station, a hotel, I thought, that would the opportunity to slum it for a few nights. But now I was second-guessing myself. Where was the mayhem that I had expected to greet me in the heart of the Indian capital? "No, madam, we are not going to Delhi," explained his driver in the bewildering airport scrum at 4 a.m., after I had begun to panic before finding him. I was being whisked away by said driver of my now obviously very important cousin to another city altogether, Gurgaon, a city reached via highways going in the opposite direction from Delhi. Surely, after a few hours of sleep, it would make more sense. If not, I could escape before my cousin returned from his business trip the next morning and set off to find the real Delhi. The following morning, I set off for Connaught Place, the headquarters of the British when they ruled India and the center of Delhi. 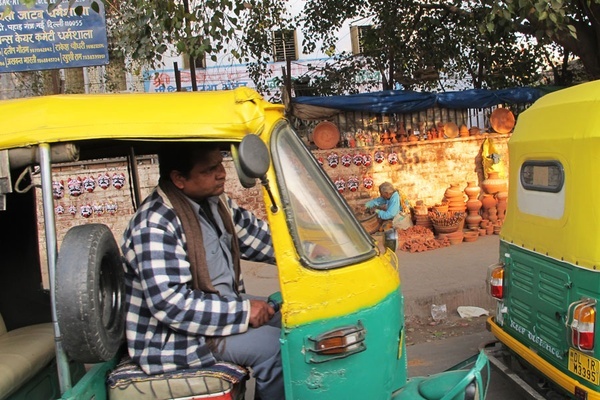 The estimated 30-minute journey took 90 minutes, and along the way, I discovered the essence of Delhi: It's all about sitting in colorful traffic for hours. 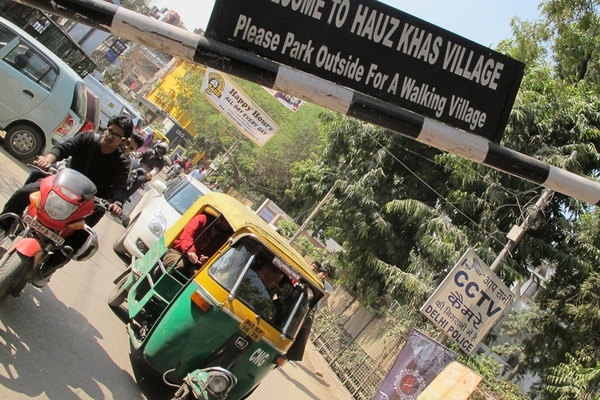 I was mesmerized by the tuk tuks, the bright green and yellow motorized rickshaws that whizzed willy-nilly down the motorway, zig-zagging between cars which ignored the lines separating lanes until we reached a toll station that marked the beginning of the Indian capital. People wandered among the traffic. A man knocked on the window, offering Jhumpa Lahiri's latest novel. Another sold bright orange washcloths that could pass for saris. As we reached Delhi, we drove through what looked like a small patch of dried jungle. Monkeys appeared by the side of the road. People sat perched on the sidewalk. 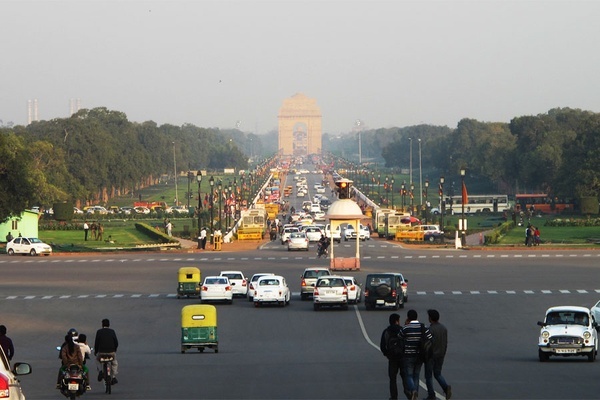 I knew nothing about Delhi when I arrived. I was on my way to The Park, the Connaught Place hotel I'd be checking into in four nights. The hotel was designed by Edwin Lutyens, who also designed New Delhi with wide leafy boulevards, roundabouts with pretty flower arrangements, and long red walls hiding lavish white bungalows. 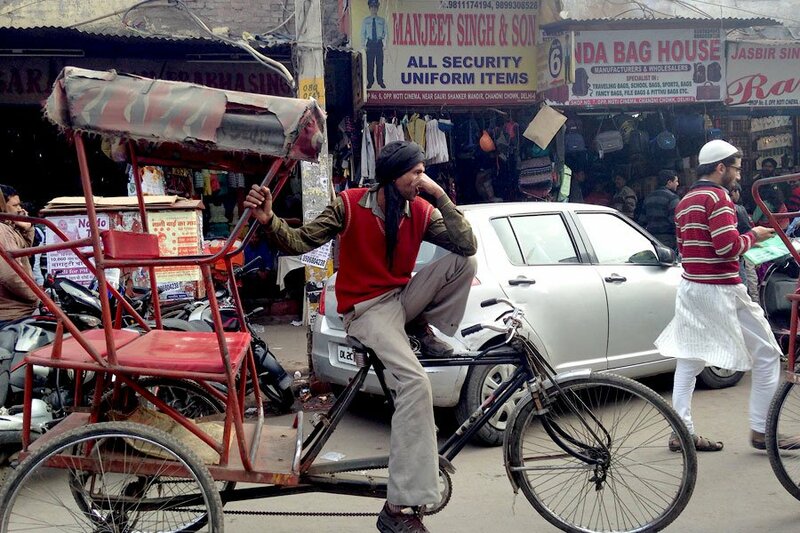 Very different from Old Delhi, I would soon discover, in style and pace. The Park was my base camp for the week, even when I was sleeping at my cousin's. 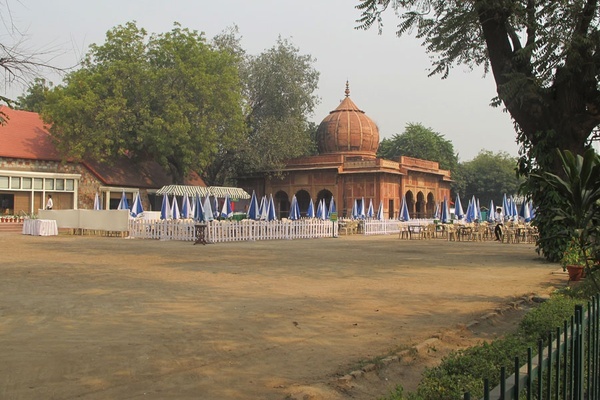 This is where the beautiful people of Delhi congregate, and it was a riot scene when I walked in. 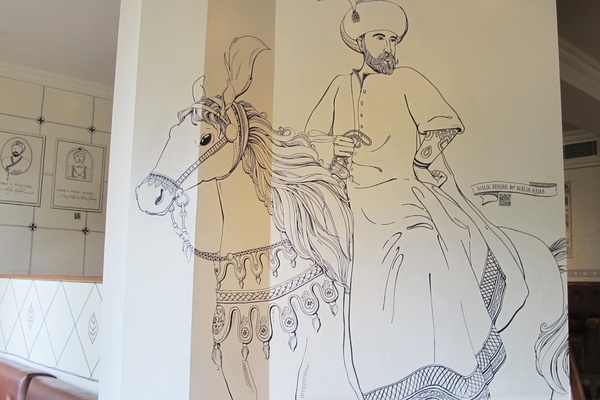 Hockey players in bright red trousers and matching bags cluttered the artsy hallway, intermingling with women in saris and men in turbans. The decor was opulent decor, with handmade glass lamps made by Klove. Mist, the airy restaurant in The Park, beckoned. Forgetting everything I had read about only eating cooked food, I brunched on the fresh buffet of salads and pulses, plates of beetroot and fish, white meats, and hot dosas and rice pancakes stuffed with mushy potato. Heaven. Then came the $30 bill, something of a joke for a country where around 500 million people live below the poverty line on less than 50 pence a day. I spent the afternoon delighting in the chaos of Old Delhi and the area around the train station, watching throngs of people all busy doing something: pushing carts laden with large wrapped bundles, mending shoes sitting cross-legged on the street, selling drinks from makeshift stands. Cows, donkeys, humans, rickshaws, and dust. I saw a men's lavatory, the cubicles exposed for everyone to see, men urinating with their backs turned momentarily to the world. I quickly took a photo. Forget the tourist sights. One should explore the station area to see the real Delhi. Every second of it was fabulous. Animated. People engaged and focused on their daily tasks, oblivious to the crowds and cars. I started to think of Delhi as the contrast between the beauty of order in New Delhi and the beauty of chaos in Old Delhi, where life seemed to be lived with a total disregard for the modern world. Then it was back for a swim at The Park. By that point, I had been adopted by the hotel. They gave tea, cookies, and dinner, plus the swim, making the $30 spent at Mist seem like a much better value. My cousin bounded into The Park to pick me up. Now about 50 and just as jolly as when he was a child, he's a big manager for an even bigger company. He had been head hunted from his job running the Rugby Association in London. We had plenty of time to catch up as we set back out into the traffic to his apartment. Guargon, he explained, was now the place to be, a new city close to the airport, favored by big businesses and anyone who could afford it. His high-rise was none other than DLF Bel Aire, the most expensive building in the area, where apartments sell for more than one million Great British pounds. The fog had lifted by the time we arrived, and we passed a French supermarket and steak house amid the stately homes. We stopped for breakfast and emergency provisions: salmon, eggs, and dark chocolate. "What do you want that for?" my suspicious cousin asked, having secured his Rice Krispies and cow's milk while I looked for the dairy-free aisle. 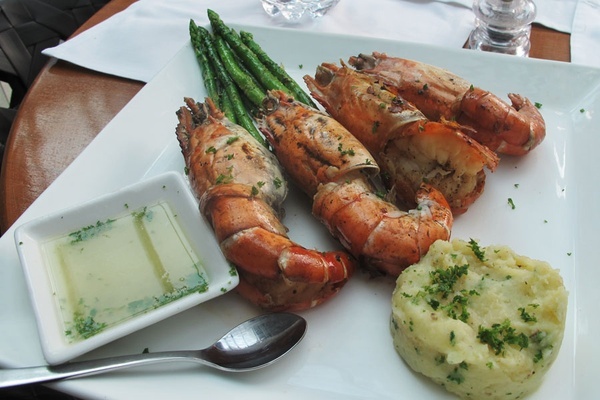 One filet mignon down next door, and Gurgaon seemed a bit more palatable. There was even the promise of dinner the following night at the Country Club and his office party, a fancy dress affair with a pirate theme and Bollywood dancing by his colleagues. But first, another Delhi adventure. I went on what ended up being a three-hour road trip in through the heart of Delhi and back out the other side to Noida, the industrial area that is now home to many of Delhi's next gen designers. I was going to find the atelier of Manish Arora, one of India's best-known designers. Outside, the shop was surrounded by cows and people sleeping on blankets on the street. Inside, young men from villages sat sewing by hand, patiently sticking sequins onto funky clubbing-meets-Indian embroidery designs, some of which were drying on a washing line on the roof. It was quite a contrast to the runway shows Arora stages for Paris Fashion Week. Forget business. The chaos on show here of designers hand-making high fashion amid old-world industrial buildings made it another must-see experience. Delhi at its rawest and finest. Abraham and Thakore's material swatch. A few blocks away, duo designers Abraham and Thakore were experimenting with wild silk, both woven and embroidered, creating pieces that looked like a Maharajah's private desert kit. They have long supplied The Conran Shop with home wares and were about to fly off to speak at a workshop on happiness and fashion, run by a guru somewhere else in this vast country. Other designers, like Gaurav Gupta and Pankaj and Nidhi, have workshops in these parts. But after six hours on the road that day, I was going back to Guargon to experience another kind of dress all together: the evening costume party. On the way home, I had to pick up my cousin at his boss's house, which resulted in an hour-long wait I used to explore the neighborhood. I experienced a Starbucks-style Indian coffee shop, complete with doughnuts, turmeric-flavored crisps, and chili banana snacks. I found a backstreet beauty salon where I had my eyebrows threaded for next to nothing, my hair colored for about three pounds, and an Indian head massage for five. Back home, my cousin tried on his pirate outfit, cutting a nifty slit down the back of the shirt to make it the perfect fit, then throwing on a tasseled jacket and tying a red scarf around his neck. "What do you know about fashion?" he asked, pleased with his seamstress skills. "This much," I said. "Pirates dangle those red cloths from their belts!" The next day in South Delhi, Samant Chauhan, a young eco-friendly designer, showed me around my favorite discovery, neighborhood-wise, Shahpur Jat, an understated district filled with narrow streets, donkeys, small boutiques, and more designers ateliers. Punit Jasuja in Second Floor Studio. 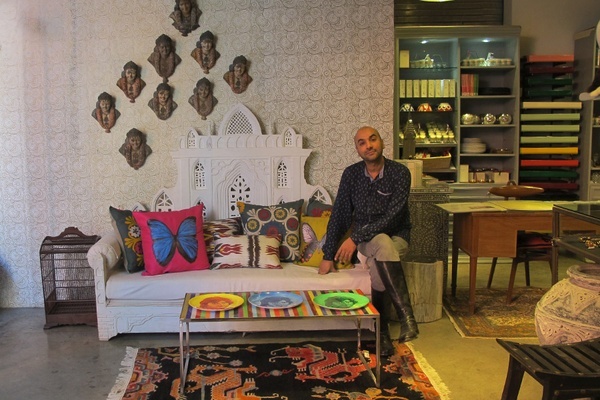 Downstairs, Punit Jasuja, a young shop keeper who had relocated from New York (his grandparents ran Bollywood theaters, he said), showed me around his concept store Second Floor Studio, which carried clothing, home furnishings, and plates painted by Bollywood theater artists. Other designer shops in these narrow, dusty, old-world streets included The Gourmet Jar, India's first gourmet jam store, and the cafe and boutique Les Parisiennes. The Mad Teapot at The Wishing Chair, a cafe inspired by Enid Blyton, serves veggie sandwiches. Turmeric Ink stocks the kind of luxury stationery one would want for a wedding. A class at Atre Yoga Studio is great for bragging rights that you've actually done yoga in India. Shahpur Jat is more of a discovery and far less touristy than nearby Hauz Khas, another much beloved neighborhood of shops and cafes in South Delhi. Samant took me for tea at the popular designer restaurant Smoke House Deli, which serves delicious East-meets-West dishes. The next day, in search of a taste of British India and a good pool, I discovered Gymkhana sports club in the heart of Lutyens Delhi, the British section. The Colonial-style club had a lawn with white bungalows straight out of A Passage to India, the kind of respite and a calm ambience befitting the British quarter. The beautiful clubhouse with fireplaces and tall columns houses a wonderful old-world bar with views of the courts and a cake shop, where a shriveled Indian lady sat quietly feasting in a scene that looked like something from back when. But the Raj returned home long ago, and today rich Indian ladies in lavish gold jewels and saris sit eating lunch under the umbrellas. The Delhi Golf Club close to India Gate, the much-photographed centerpiece of New Delhi and probably its most famous monument, is another Colonial gem where golfers can pay $50 or more for a round and non-members can sneak in and have a peek at the old clubhouses and dining terrace overlooking the course. The untamed greenery in the molten sunshine casts a romantic pall over proceedings. You can understand why the Raj would have wanted to make this splendid country their own. Around India Gate and the parliament buildings designed by Lutyens are beautiful lawns and gardens, some decked with seating for parades, as well as a handful of museums in old red stone buildings, like the so-so National Museum, which has a collection of carvings on display in rundown hallways. An exhibition piece by Subhod Gupta. 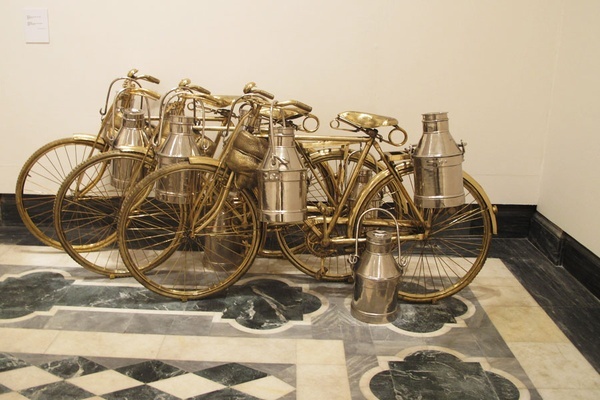 I went to the much nicer National Gallery of Modern Art for a show by Subhod Gupta, one of India's best-known artists. A lovely little garden surrounds the gallery and Gupta's giant creations were on display inside. He does modern creations in metal, such as discarded pots and pans piled up like rubbish, bicycles, and oversized boats. The next day was the opening of Made in India..., backed by the philanthropic organization Be Open at Indira Gandhi National Center for the Arts. The excellent exhibition showcased specially commissioned luxury hand-crafted creations from notable fashion, textile, and furniture designers. Gaurav Gupta showed what looked like partially clad sculptures. Thukral and Tagra, two amusingly dressed designers in bright suits, made iPod stands that looked like old conical clay houses. 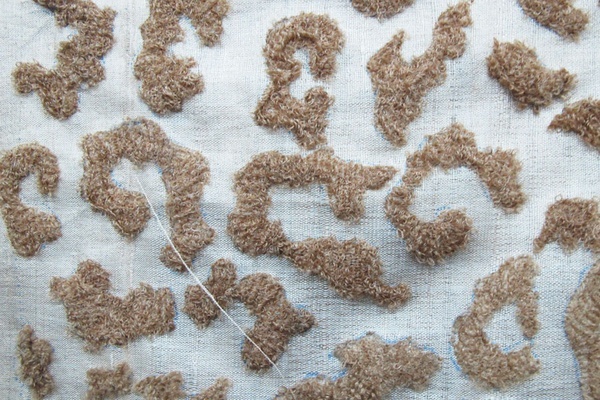 Sunil Sethi, the head of India's Fashion Design Council, created roughly sewn floor cushions that looked like someone had skinned a coarse-haired cat. Rahul Mishra, a young designer shortlisted for a Woolmark prize, talked about Gandhi and the series of striking hand-embroidered jackets, dresses, and a table he designed with a bold black and white geometric pattern. 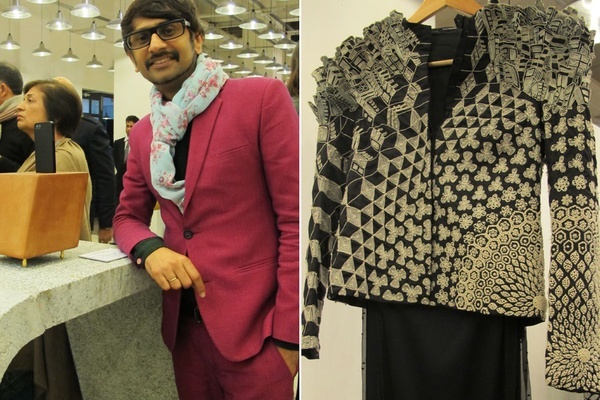 Left: Jetin Thukral of Thukral and Tagra with their iPod stand; Right: Rahul Mishra's hand-embroidered jacket. Guarav Gupta keeps a shop the city's most exclusive shopping mall DLF Emporio. The ground floor is filled with Western brands like Dior and a designer cafe, but the must-see second floor is dedicated to fine saris and Indian attire made by such designers as Ashish Soni, Ritu Kumar, and Rohit Bal. I found more new designs, fine pashminas, and watches at a pop-up store in the city's most expensive market neighborhood, Khan Market, a series of small stores selling everything from the Body Shop to Amrapali jewels. Inside Jasuja's other Second Floor branch, a new shirt collection was being presented one Saturday night as a handful of expats admired the shop. The legendary kebab joint across the street, Khan ChaCha (50 Middle Ln., Khan Market; +011-246-332-42), serves yummy potato dishes and grilled meat. Newspaper articles plastered on the walls show dozens of raving reports. But far more delicious is Bukhara in the ITC hotel near Connaught Place, which during my trip was repeatedly recommended as the best restaurant in India. They served North Indian cuisine, grilled meats, and a lentil dish that takes three days to prepare and simmer. A delectable lamb on the bone was certainly the best dish I ate in India. I am a big fan of fabulous swimming pools, so I was glad to discover The LaLit hotel, whose beautiful heated pool was the best I found in Delhi, with beach-style cabanas. I also liked the old-world style of The Imperial Hotel and luxurious interiors at The Leela Palace. In addition to being great hotels, they're good bolting holes for escaping the crowds. 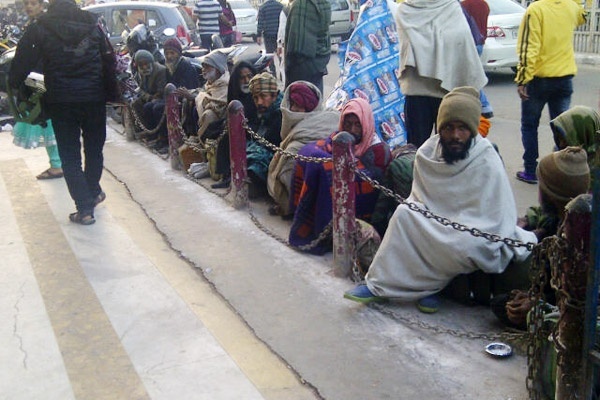 At the other end of the spectrum from Khan Market is Chandni Chowk, an outdoor market in Old Delhi where anything goes and beggars crouch patiently outside a local temple wrapped artfully in blankets. I saw a man run naked through streets jam-packed with rickshaws and cars. In these narrow aisles, you can buy knock-off Nokias from China, colorful casual clothing, wall clocks, and junk you'll never use again. En route from Chandni to Khan Market on a Saturday night, we passed several wedding processions making their way through the streets with much fanfare. Bands in crisp ceremonial white suits and rich turbans banged on drums and tooted on trumpets. Guests wearing their finest, brightest saris mingled under fairy lights like a colorful swarm of fish. The scene imparted a sense of vibrancy seldom experienced elsewhere. Leaving Delhi for Jaipur a few days later, I laid myself bare to the experience through which one can best understand the country: a train ride. I found myself at the wrong station on the wrong day, and spent an hour and a half crossing Delhi to Old Delhi train station to catch a 3 p.m. train. Inside a dark ticket office, men lined up on seats waiting their turn at the counter. Tuk tuks jammed the street outside beyond tea stands and omelet vendors. The train pulled into the station with faces peering through third class bars on the windows and limbs dangling from upper bunks. I perched in the corner of a day sleeper in second class, a cabin to myself, and looked out through the door thrown open as we traveled slowly south. I could see Delhi in full view, colorful slum housing lining the side of the tracks, between which children and goats wandered. Women hung washing between rails cut through old stones into the distance. A series of small stations passed, and the chaos of Delhi, the over-populated sprawl of some 22 million people, gave way to verdant planes and beautiful, peaceful, wide-open space there for the taking. How far would one have to walk to escape the chaos and pitch a lone tent for some peace and quiet and to start a new life? Not far, I thought.